The joint training program of PhD and master of Analytics between CUIT and University of New Hampshire (UNH) was held in the 7th Conference Room of the Administrative Building. Leaders and Professors from UNH attended the conference, which include Wayne Jones, Vice President; Lisa Ranfos, Clinical assistant professor and executive director of CSDC Department Chair, HDFS; Michele Dillon, professor of Sociology, interim dean of the College of Liberal Arts; and Wang Yige, Director of the Confucius Institute. 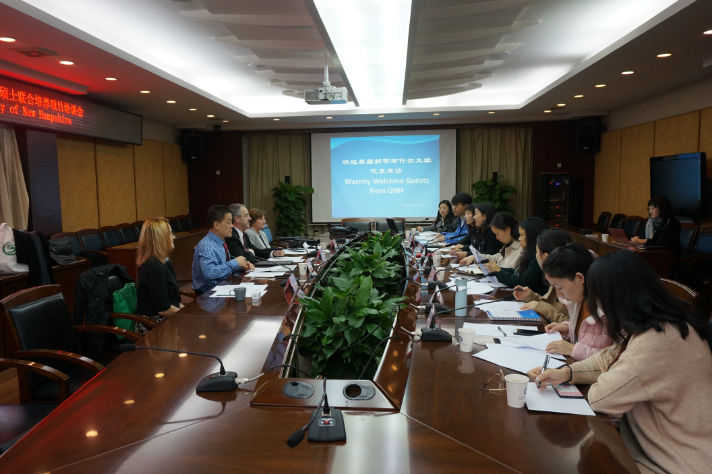 CUIT representatives attended the conference, which include He Jia, Director of the International Office, Tang Tingting, Deputy Director of the Graduate Studies Office, as well as directors and faculty representatives of the related colleges. Ms. He Jia introduced CUIT and the progress of the joint student training program with the UNH of the United States. She said that CUIT would continue to strengthen advocacy efforts in order to better promote the collaboration between the two universities. Mr. Wayne Jones introduced UNH and the achievements they had made on international cooperation. He said UNH would welcome outstanding CUIT freshmen participating in the exchange student program developed by both universities, and he also proposed to establish a long-term exchange mechanism for students, teachers and scientific research to further promote multi-level exchanges and cooperation between UNH and CUIT. Representatives of the two sides held in-depth talks on joint training program of PhD and master of Analytics, exchange student program and other related issues on international cooperation.